Our first profit target was hit yesterday, where we closed half of our position and moved our stop to break even on our remaining position. We did not get to see a follow through of the rally as sellers were waiting to jump in around 1.6250 and push the pair back to our stop out level. Our remaining position was closed at break even. So, we got a bit of profit to close out the weekend. Congrats to those who did well on this trade and have a wonderful weekend! Our position was entered to go long at 1.6185 yesterday, and it seems support at 1.6180 has held through our today’s Asian and European trading session. EU data has been supportive of our position as the latest German Ifo data surprising to the upside. So, it looks good for now, but my current concern is if the return to risk aversion and USD weakness will drag our trade down with it? We’ll just have to wait and see. For now we will hold onto our position, and with the pair currently trading around 1.6215, we are about 20 pips from our first take profit. Don’t forget to adjust your trade if we do hit 1.6235. Good afternoon! 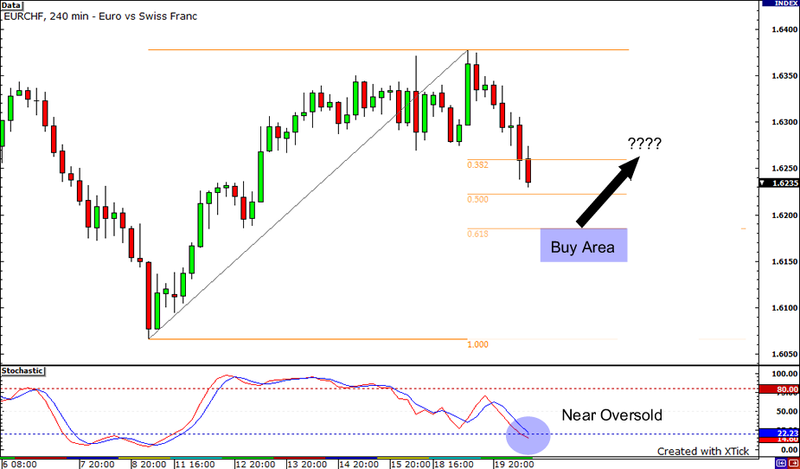 The recent risk aversion may bring us an opportunity to catch the longer term uptrend in EUR/CHF. Eurozone data has been positive for the Euro with PPI and ZEW economic data supporting the ECB’s hawkish stance on rates, so the Euro rally may continue. On the chart, we are using a Fibonacci tool, and with momentum currently on the downside on risk aversion, we will use the 61.8% Fibonacci level for our entry as I think traders are currently eyeing that area for support. Also, stochastics are showing the pair may be near term oversold and the momentum may be running out of steam. We do have event risk tomorrow with the German IFO Business sentiment data expected to move the Euro around if we see data a deviation from expectations of around 102.1. Please be cautious around this event. Stay tuned, good luck and good trading!